“Fathers' Letters,” published by the Memorial Society, is a poignant book compiled from a unique archive of letters and drawings from prisoners of Soviet camps. The book “Fathers’ Letters” is based on an exhibition of the same name held by the Memorial Society, which was granted access to letters sent from political prisoners in the Gulag to their children. These letters, which had been treasured for decades, offer an insight into these fathers’ attempts to maintain some element of parenthood despite their harsh imprisonment. “Fathers’ Letters” focuses on 16 men who were progressive, successful public figures. They all worked long hours and only saw their children when they had already gone to bed. Then, when they were imprisoned, they realized that the only way to influence their children's intellectual and spiritual growth was through letters. "The book doesn’t deal with letters written to mothers, wives or sisters," says Irina Ostrovskaya, curator of the original Fathers' Letters exhibition. "The subject here is fathers' letters." In their letters the fathers hurry to pass on as much valuable information to their children as they can. As well as knowledge, they express their love and tell interesting stories to captivate their children – just like any normal parent would. As well as giving the prisoners a vital opportunity to communicate, these letters also functioned as a chronicle of their lives. The subject matter is made all the more poignant by the fact that none of these fathers returned home from the camps. Professor and meteorologist Alexei Vangenheim was the founder of the Soviet Weather Bureau, as well as the founder and first director of the USSR's sole hydrometeorology service. He was imprisoned in the Solovki Special Purpose Camp, from where he wrote his daughter 168 letters. When he was arrested in 1934 she was four years old, and for the next three years – until her father was shot – she was raised and educated according to a system that he devised specially for her. Vangenheim wrote and drew special reference books with detailed descriptions of flora and fauna, as well as puzzles for her general development. 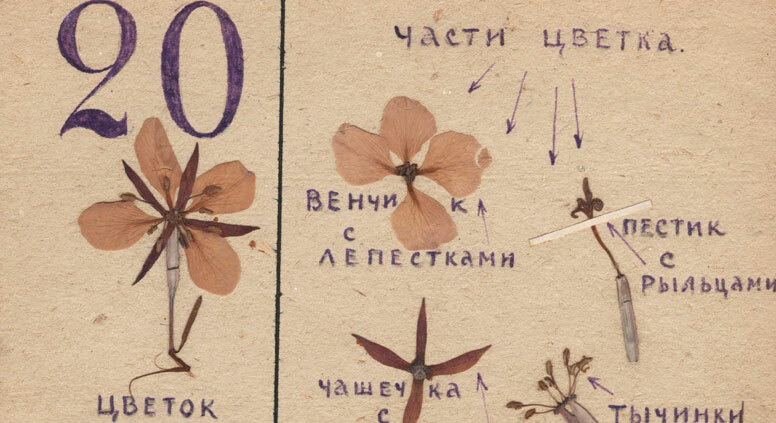 He taught her how to count with the help of a herbarium made up of Solovki plants. He would make mosaic drawings of the Solovetsky Monastery and the White Sea from stones, sand and brick fragments. Eleonora Vangenheim, who later continued the family tradition by becoming a notable scientist, carefully preserved all this material and gave it to Memorial. "My dear little star Elechka! I'm sending you a drawing of a bullfinch nest. It builds its little nest on branches not far from the ground. On the right is a natural-sized egg. Write me what number you can count up to and how your reading is. Take care of our dear mother. Make sure she eats well and more often. Your loving father sends you lots of big kisses. 11.30.1934"
Along with letters, Gordon wrote a philosophy and history textbook for his daughters, compiling them from memory, without reference literature and primary sources. "… Or in a staffroom filled with noisy, rudely bickering people, or at night in a barrack to the snores of sleeping strangers to whom I am indifferent… But when I wrote, my dear daughter, my big love for you would take me away from the difficult reality surrounding me and lead me to that delightful world of pure thought and images of a wonderful bygone era, which, together with music, has always been the real treasure and substance of my ‘I’ …"
Gordon was supposed to be released in August 1941, but the start of World War II prevented this, and he died from hunger at the beginning of 1942. His younger daughter, Irina, went on to become a successful English-Russian translator. Vladimir Levitsky was a soldier who had fought in World War II, and an instructor at a Cadet Corps. He was imprisoned in a Siberian camp. "He was completely different to the others," Irina Ostrovskaya explains. "He was not a professor and was not as intellectually brilliant as them. He was a collector: his biggest passion was stamps." Levitsky, who was shot in 1937, would decorate his letters home with stamps that he drew himself. He composed essays for his son where he described and drew everything around him: Siberian nature, the village, his prison, and the landscapes that he saw from his window. His son Oleg also became a collector. These prisoners' children did not forget their fathers and did not betray the spirit of their lives. They were forced to grow up with the knowledge that society had branded their fathers "traitors" and "enemies of the people,” but the letters offered them a window into their true characters. According to Irina Scherbakova, director of Educational Programs at Memorial, each one of these “pearls” was preserved when it arrived. In her view, “they are not only family treasures; they represent man’s moral victory over the unquestionably inhumane system that existed in that period."